This top quality low level shower tray with an overall height thickness of only 32mm is made out of 2.5mm steel with a very hardwearing stove enamelled finish. The enamel is baked on at a temperature of 850 oC and is so hardwearing that it is acid resistant, impact resistant and scratch proof. These bathroom shower trays are so stable and long lasting that they come with a 30 year manufacturers guarantee. 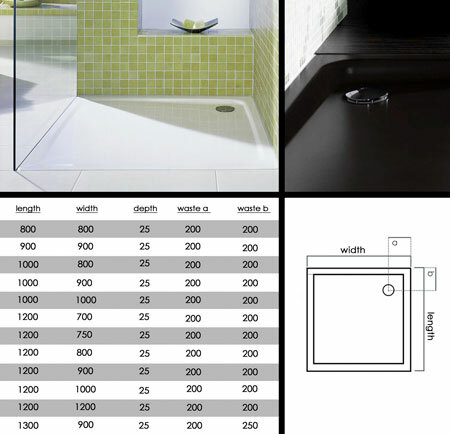 "Highly Acid, Scratch & Impact Resistant"
* Rigid shower tray construction. * 25mm internal tray depth. * Shower tray in 12 sizes.